Lucky(Allu Arjun) was a julayi and always goes against his brother Ram(Kick Shyam). One day Lucky met with as accident and comes to know ,actually that accident was planned by Siva Reddy(Ravi Kishan) to kill his brother Ram. Lucky decides to teach Siva Reddy a lesson. He warns the Siva Reddy to stay away from his family.How Lucky does get involved in this and saves his brother and family is the rest of the story. Allu Arjun performance is the biggest asset for the Movie. 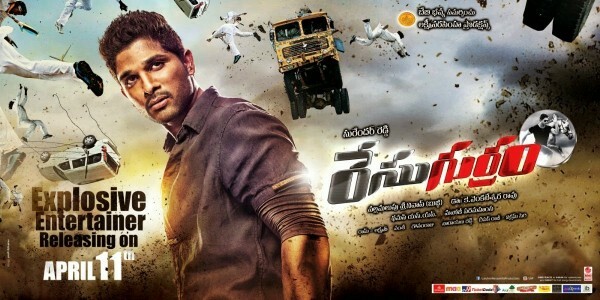 Allu Arjun dances and dialogue delivery are super, especially his dialogue “Devudaa….“. He is extra ordinary in comedy timing.This will be remembered as one of his best performances. Allu Arjun performed his role with ease both as brother and lover. He enthralled all sections of audiences with his performances. Shruthi Hassan is cute with looks and performances but her role is limited to first half. She sizzled with her massy dance moves in cinema chupistha song. Saloni is ok as Kick Shyam love interest. Ravi Kishan as villain is not perfect his performance has ups and down. Brahmanandam rocks the screen as Kill Bill Pandey ,without him you can’t even imagine second half. Brahmandam performance will be remembered for long time. Prakash Raj is apt, Shyaam is perfect as Allu Arjun brother and his performance is good, Ali, Posani does good job, Mukesh Rishi, Tanikella Bharani, Pragathi are apt for their respective roles. Race Gurram guarantees loads of entertainment with high energy performances and ample stylishness. The conflict scenes between the brothers are well-shown. Comedy scenes are very good you can enjoy entire film with no boring elements.First half of the movie is just time passable with entertaining scenes here and there. The main asset of the film is second half with lots of entertaining scenes and gripping screen play. Surender Reddy direction is good but failed to maintain action,sentiment,comedy in right proportions. Thaman music is good already three songs in the album are chartbusters. The songs are presented well on screen but the placement of the songs is not good. Actually there is no need of songs at some places just they have incorporated them with out any reason.Background score is not up to the mark. Vakkantam Vamsi’s simple story becomes effective with neat treatment and plain screenplay adopted by Surender Reddy. Action is loud. They should have composed some decent fights.Dialogues are pretty good. Cinematography is good and visuals look bright and color full. Editing could have been better. Allu Arjun started the Summer with Blockbuster. Don’t miss Allu Arjun and Kill Bill Pandey performances . This gurram wins the race watch it!!! !